The modular nature of the LG G5 is easily its most intriguing new feature, not only for the range of standalone peripherals and insertable modules it supports but also for what it means for LG going forward. If the idea is picked up it could mean huge things for not only LG but smartphones in general, but it could also signal bad things for the G series if it doesn’t catch one. 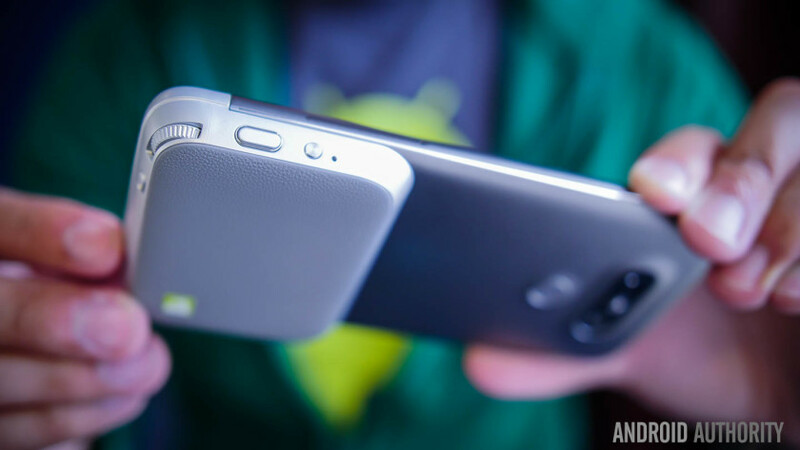 Let us take you through all the new LG G5 modules announced at MWC 2016. First thing’s first, the name. In the lead-up to launch, the LG G5’s modular design was known as the Magic Slot. This is not the official name and in fact there is no official name for the slot itself. Rather, the various modules and peripherals are called LG Friends, complete with a new cool cat icon and signature lime green color. Depending on how well the modules are received, other LG devices might also support modules in future. Not all of the LG Friends are modules that physically slot into the G5, some are standalone products, like the new LG 360 VR camera or LG Rolling Bot (think of a headless BB-8) and will work with other phones besides the LG G5. Others, like the LG CAM Plus or LG Hi-Fi Plus slot into the base of the LG G5. LG is making the proprietary connector available to selected third-party makers to create their own custom modules and accessories. All modules replicate the bottom edge of the G5 as part of the module itself. On the software side, all modules and peripherals are auto-detected by the pre-loaded LG Friends app, which automatically downloads the companion app for each new accessory in the background. LG demoed four modules with promises of a drone at the press conference, which we’ll explain in detail below. The LG CAM Plus is the module we leaked a few days ahead of the LG G5 launch. It is a bulky module that adds finer controls to the G5’s existing camera functionality at the same time as providing additional grip and an extended battery. The bottom of the LG G5 is removed via a small button on the lower left hand edge to disengage the locking mechanism. The default module can then be removed and the battery popped off the base. The battery is then snapped onto the LG CAM Plus module and reinserted into the G5. The LG CAM Plus adds an extra 1,200 mAh to the G5’s 2,800 mAh battery for a total capacity of 4,000 mAh. There’s also a dedicated shutter button, which can be half-pressed for focus lock, a zoom dial, video record button, LED and power switch. LG is claiming an additional 15% usage time and “real camera UX with one hand”. The LG Hi-Fi Plus is an audio module made in collaboration with Bang & Olufsen. The module features a 32-bit Digital-to-Analog Converter (DAC) and dedicated amplifier. The Hi-Fi Plus DAC supports up to 32-bit source files and native DSD playback. It also boasts audio up-sampling to 384kHz and there’s an “up-bit” feature to convert lower bit-depth files into a 32-bit format before they head out of the DAC. The LG G5’s standard DAC supports 24-bit bit depths. When the Hi-Fi Plus is attached, the existing headphone port on the top of the G5 won’t work, as the headphone port located on the bottom of the module is prioritized for its superior sound quality. The Hi-Fi Plus does not contain a battery, so it only works when attached to the G5, but it can also be used with other USB Type-C-equipped devices. The standard G5 headphone port provides 24-bit audio tuned by LG, whereas the 32-bit Hi-Fi Plus is tuned by Bang & Olufsen, to provide a greater audio experience for audiophiles. The LG 360 CAM is a dual-lens, standalone 360° VR camera that pairs with the LG G5 via Bluetooth but still carries the LG Friends branding. It has 4 GB of built-in storage with a microSD card slot, three microphones, a 1,200 mAh battery and two 13 MP cameras that combine to form 16 MP flat or spherical images. Each camera captures 200° and is stitched together for a full 360° image. The LG 360 CAM supports 2K video and is supported by YouTube 360 and Google Street View. Images and video are processed and stored locally on the LG 360 CAM and are then transferred to the G5 wirelessly although the G5 also supports real-time previews from the 360 CAM. The LG 360 VR is a tethered virtual reality headset that connects to the LG G5 with a USB Type-C cable. It can be operated either with headset controls or via the G5. Because it is cabled to the G5, the headset itself is much smaller and lighter than most other VR head units at just 118 grams. LG claims it can be comfortably worn for much longer than larger, heavier and less comfortable VR units. The individually-adjustable 360 VR lenses are 1.88 inches each with 960 x 720 resolution, producing a pixel density of 639 ppi. LG tells us the experience is like looking at a 130-inch TV from two meters away. There’s a headphone port on the bottom left of the glasses but you can also plug headphones into the G5 when it is tethered. There’s an OK and Back button on the unit, but you can achieve the same thing on the G5 via a tap or long-press on the screen. 2D movies in your gallery can also be watched on the 360 VR unit, although they won’t be in VR for obvious reasons, and the LG 360 VR is compatible with YouTube 360 and Google Cardboard. The LG Rolling Bot is kind of like a decapitated BB-8 unit from Star Wars: The Force Awakens. It’s a little spherical robot, a bit smaller than a soccer ball, that contains a camera, speaker and multi-colored laser and can be used for home monitoring and terrorizing your pets. What do you think is the best LG Friends module or peripheral? What other LG Friends can you envision?